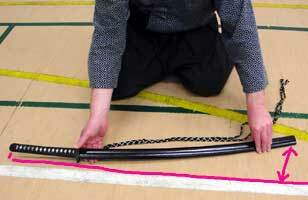 This presentation was created for the benefit of students of Sakura Ternat. 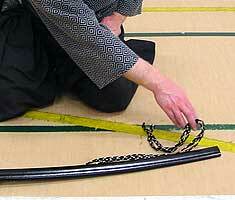 No authority is implied beyond this context. 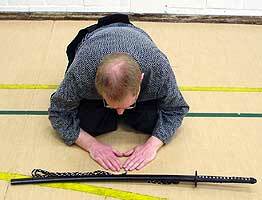 The bow to shomen is the most formal part. 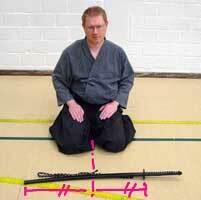 There is no presence of kasso teki (invisible opponent). 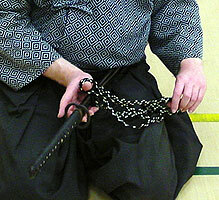 Sageo is over the middle or index finger, about 1/3rd from the ends, so the loose ends hang just slightly lower than the loop. 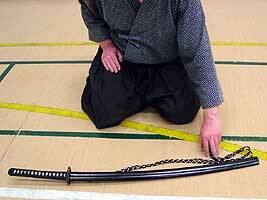 From teito, bring the sword in front of the body, maintaining the 45° angle, edge inwards. 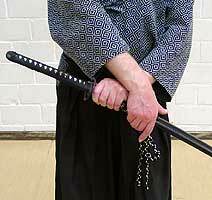 The right hand takes the saya below the left hand in such manner that the edge points downwards when the sword is brought to the right side. 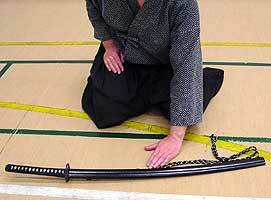 Bow to shomen while maintaining the angle on the sword. 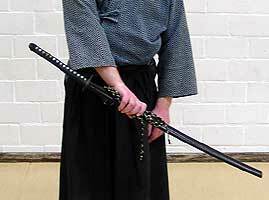 Bring the sword in front of the body again, this time with the edge facing out. 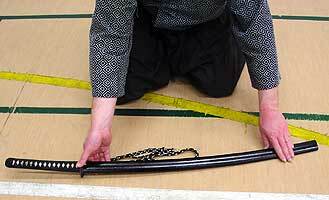 Transfer the sword to the left hand again in such a way that the edge points up when the sword is brought back to teito. 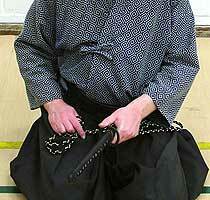 If possible, get the sageo back over the middle or index finger. 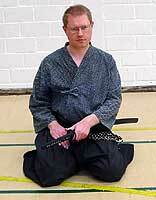 Go to sonkyo, then place the left knee on the floor, followed by the right, and sink into seiza. 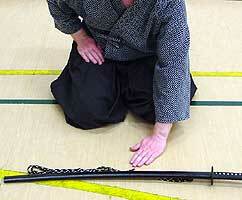 During this bow, the presence of kasso teki should be shown. 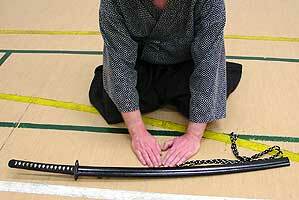 Slide the sword forward and transfer it to the right hand, the thumb controlling the tsuba. 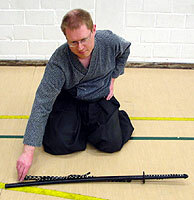 Straighten the sageo and grasp it and the saya with the left hand about 10 cm from the kojiri, with the sageo on the outside. 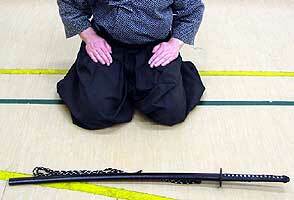 Bring the sword forward, drop the sageo first, and place the sword on the floor behind the sageo. 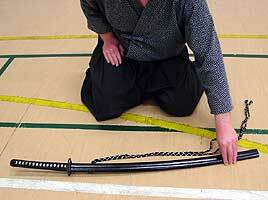 The kojiri is slightly closer than the tsuka. 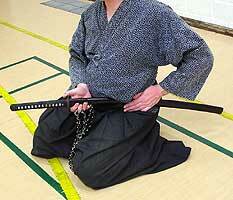 The sword is as close as possible while allowing sufficient room for the bow. 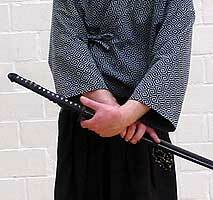 The right hand is brought back to the hip first. 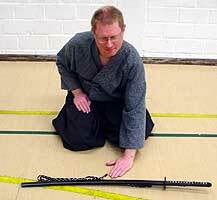 The left hand can optionally adjust the sageo so it doesn't extend beyond the end of the saya, however this should be limited to one movement. 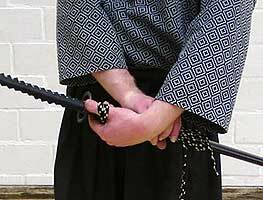 Avoid showing the inside of the hand. 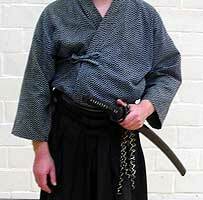 Return the left hand to the hip. 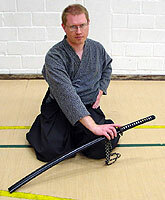 Note that the middle of the sword is in front of the center, this corresponds approximately with the tsuba before the outside of the right knee. 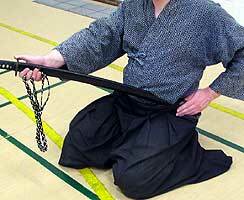 The bow itself; left hand goes first, then right. 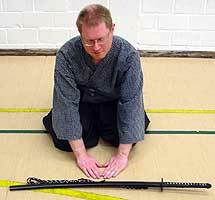 Bow down with the back and neck straight until the elbows almost touch the floor. 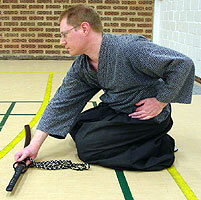 Straighten up and bring the right hand back to the hip, followed by the left. 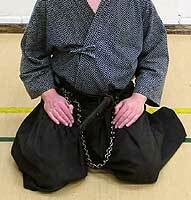 Pick up the sageo between the right index and middle finger, then bring the right hand towards the tsuba, avoiding showing the inside of the hand. 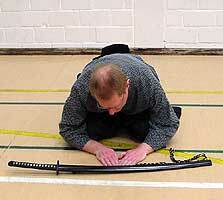 Pick up the sword with both hands simultaneously in the same manner as it was put down. 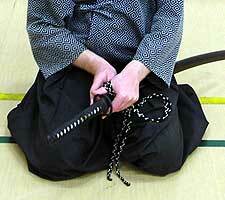 Bring the kojiri towards the center of the body and insert the sword in the obi. 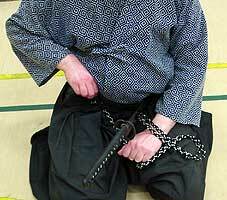 Try not to raise the tsuka above shoulder level. 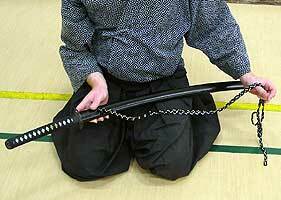 Once the saya is inserted properly, the left hand is placed on the hip before the sword is slid into position. 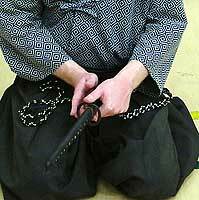 Attach the sageo to the hakama himo, preferably passing the left hand under the sword. 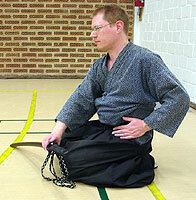 After moving into seiza, place both hands on the legs (formal seiza) before starting the reiho. 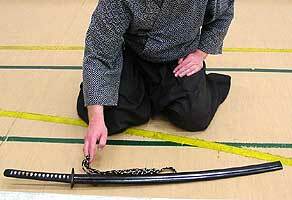 Pull the sageo loose, and slide the sword forward with the left hand. 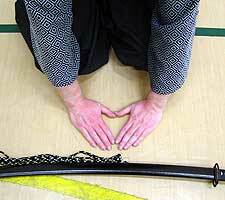 Transfer the sword to the right hand, using a straight index finger to control the tsuba. 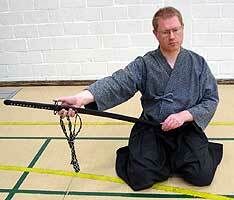 Straighten the sageo and loop it over the right thumb. 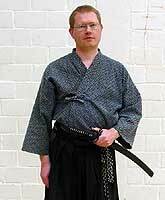 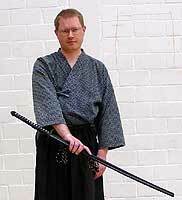 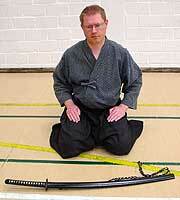 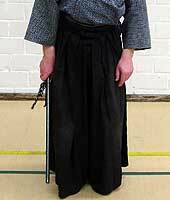 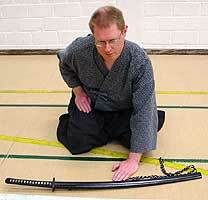 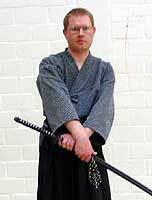 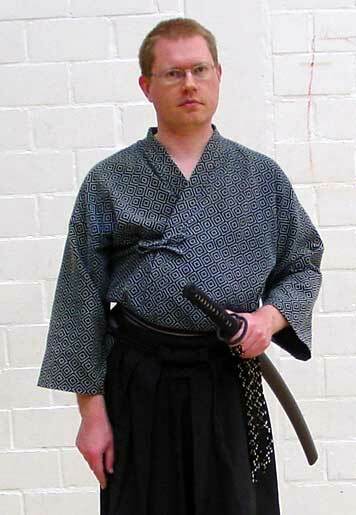 Slide the sword out of the obi and place it vertical before you, slightly outside the right knee. 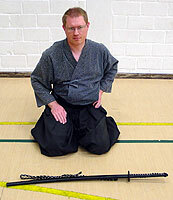 Place the sword down in front, with the edge pointing inwards, taking care that the sageo is not trapped under the saya. 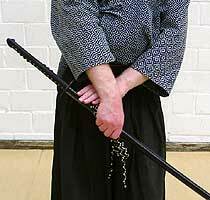 The left hand remains on the obi. 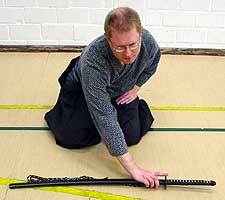 Straighten the sageo and bring the right hand back on the leg. 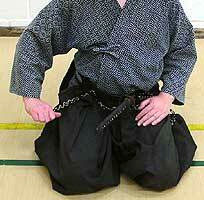 Then slide the left hand from its position on the obi to the leg. 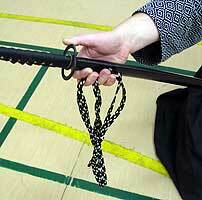 This time, the middle of the blade (rather than the middle of the entire sword) is in front of your center. 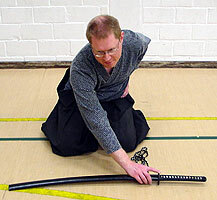 The bow to the sword is identical to the opening rei. 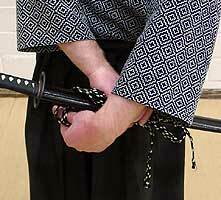 The right hand picks up the sword, again controlling the tsuba with a straight index finger. 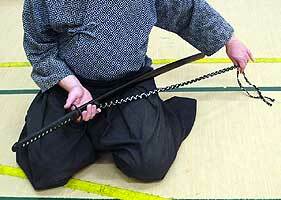 Rotate the sword up without dragging the kojiri on the floor, until the tsuba is in front of your center. 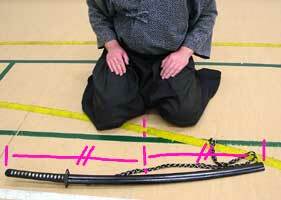 Place the sword in front of your center, close enough to reach it comfortably. 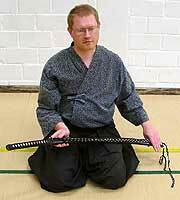 Extend the left hand and grasp the saya and sageo below the middle of the sword. 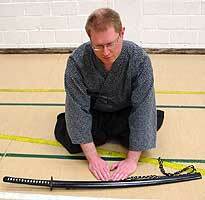 Slide the left hand down to 10 cm above the kojiri, straightening the sageo. 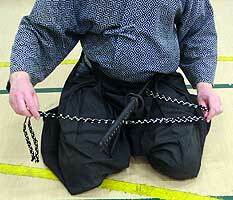 Bring the sword on your lap, loop the sageo over the left thumb, and transfer the sword to the left hand. 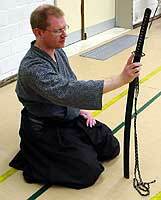 The bow to shomen is identical to the one from the opening rei, except that the sageo is now looped over the thumb. 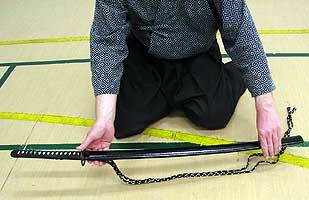 In teito, the sword is held at hip level, the proper angle of the sword is about 45° and the kashira is centered.